Virtual worlds are considered immersive environments, and as such, it’s not unexpected that the element of social presence plays a rather important role. 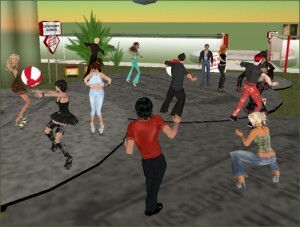 Virtual worlds have an advantage over traditional forms of distance learning in this area, since the avatar is represented by many of the familiar visual and social cues humans are used to. In Aragon (2003), social presence is defined as the “degree of salience of the other person in the interaction and the consequent salience of the interpersonal relationships” (p. 59). Immediacy, or the “measure of psychological distance that a communicator puts between himself or herself and the object of his/her communication,” can be conveyed by physical proximity formality of dress, physical proximity, facial expressions, and other nonverbal cues, as well as verbal (p. 59). This can apply directly to virtual worlds, since players are given control of all these social conveyances, and it is important because it lends to the immersion of the game. What’s interesting, however, is that some research suggests the human interface control is not as relevant as one might think. A study in Aymerich-Franch (2010) revealed that participants who played a game by using their whole body did not experience any significant difference in presence or emotions than participants who played with a joystick. This implies that body-dependent systems such as the Wii and Kinect may not necessarily be more “immersive” to players, if we define immersion as a combination of social presence and emotions, and that we should look to other attributes when determining what makes one game more immersive than another. I would suggest that we should look more at the content of the virtual environment itself, than the human interface used to connect to it. In another article by Lin (2010), an exploration of gender differences on game enjoyment is examined, as well as personal identification with the character. I feel this article misses the point, particularly when it claims that players are more likely to enjoy a game when the character they are playing is “morally justified” in the story or plot. In other words, a hero fighting for some sort of moral good. This seems logical, until one realizes that some of the top selling games like Grand Theft Auto don’t fit this mold, though one could argue that much of the villainous violence in these games follow a storyline causing the player to sympathize with the character. The genius of games like World of Warcraft is that both sides have sympathetic characters and heroes, and reasons for engaging the rival. The article sidesteps this issue by admitting that yes, some players are the opposite — even a significant number — and attempts to explain why. It seems self-contradictory. I’ve been sporadically on Second Life since 2005, though only started taking it seriously since 2010, taking time to identify important locations, learn some scripting, and so on. I figured this was all worthy of a “rebirth” so I ditched my old character and created a new one. I think Second Life profiles are an important, yet perhaps underused element of social presence in a virtual world. They can serve to tie the avatar to a real user behind the screen. People are a lot more prone to do things in Second Life they wouldn’t normally do in person. This is really nothing new, and applies to virtually all communication on the Internet. I think there is a degree of accountability that comes into play and prevents some severely offensive behavior when avatars are specifically identified with real people, but when there is full anonymity, it is rather chaotic and anarchic. Aymerich-Franch, L. (2010). Presence and emotions in playing a group game in a virtual environment: The influence of body participation. Cyberpsychology, Behavior, and Social Networking, 13(6), 649-654. Lin, S. (2010). Gender differences and the effect of contextual features on game enjoyment and responses. Cyberpsychology, Behavior and Social Networking, 13(5), 533-537. Excellent post. I agree that in the context of pure entertainment too much gaming can be unhealthy, but I also believe that we need to consider the type and form of gaming a person engages in rather than caution against excessive gaming across the board. The Immersive Education Initiative, for example, advocates the use of learning games for teachers and students. With thousands of academic members this non-profit consortium now has over half a million students “playing” learning games that are freely available and actively promoted by teachers as opposed to discouraged. They also utilize traditional video games as incentives for students to complete homework, in a more controlled fashion than you might imagine. Last month they also began education teachers and parents about video game addiction and violence, providing guidelines to identify students and children who do have legitimate issues with gaming. Interestingly, a wide range of Immersive Education members have developed modern learning games that are similar to traditional video games, specifically to engage the student. From Harvard to Temple to the Smithsonian you’ll find a range of game like learning environments that the organization promotes, some of which can be seen in the videos at their website http://members.ImmersiveEducation.org where you can also find a wide array of peer-reviewed literature that supports the value of games (all types of games, even World of Warcraft and its ilk). And so although I am deeply concerned about the amount of pure entertainment-based gaming our youth (and let’s face it, adults) engage in I believe that we are on the verge of seeing a different form of game compete for our time: the learning game. In the near future I would not be surprised if high-quality learning games are competing directly with video games for users attention, and that would not be a bad thing. In fact it might be a quantum leap forward for education and society. Thanks again for a thought-provoking article, which I had intended only to scan and ended up reading in detail and being motivated to reply to.